Centralized intake refers to a single place or process for people to access the prevention, housing, and/or other services they need. It may be the only “door” for particular kinds of assistance, or there may be other ways to access assistance. 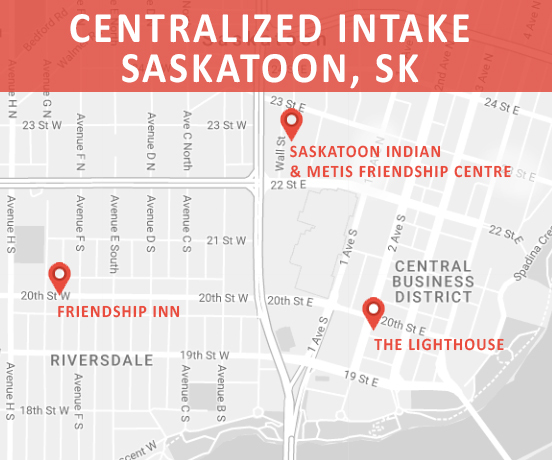 Centralized intake can serve as a point of referral or admissions for a broad variety of service and housing programs that operate in a community. Intake assessments are done at the Friendship Inn and Saskatoon Indian and Métis Friendship Centre on a walk-in basis by either our male or female intake worker. Intakes can also be completed at off-site locations within the community if requested. Based on the results from intake, the client is referred to the Rapid Re-Housing or Housing First program, and/or other community organizations as appropriate. This is not a crisis response service. There may be a wait time before housing is available. If you would like to contact a centralized intake worker, please fill out this form. Your identity and information provided will remain confidential, and will only be read by our centralized intake worker.